>> Sam, Is this standalone or still hooked up to the grid? My most popular kits are our award winning RoofMill kits, wind/solar hybrid kits, grid tie with battery backup power for emergencies. That system will run a home with or without the grid but can send any excess power to the utility company running a meter backwards. 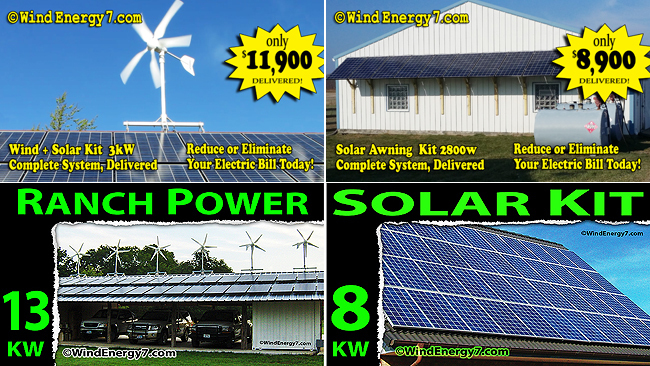 My most popular size is 5kW and 6kW at a good price point. 95% or better of my kits are that popular size of 2 turbines and 12 to 16 solar panels. But I do all kinds of systems. Best answer I can give actually is a question "What kind of system do you need?" because I have all kinds of designs and technology to power anything, anywhere, anytime. I power high security bank vaults with 5 sources of redundant power, communication towers off grid, homes, businesses, farms, factories, well pumps, anything.